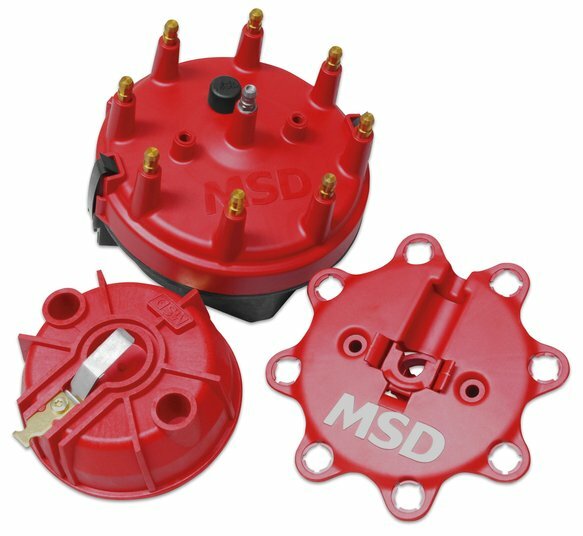 The MSD Cap-A-Dapt adapts a large, Ford style cap onto your MSD distributor. This large cap spaces the spark plug terminals farther apart which lessens the chances of cross-fire and ionization occurring. The rotor is injection molded out of Rynite® for incredible strength and resistance to spark. Thick vanes are incorporated to stir up the air in the cap for even more ionization prevention. The Cap-A-Dapts will install on most MSD Pro-Billet Distributors (except the Ford FE, PN 8594). Both kits are supplied with a high quality cap with brass terminals, rotor and cap spacer. Convert your small diameter to a big cap. Lessens the chance of cross-fire.